Yellow Fin Tuna Steak, pan seared with Toasted Sesame Seeds and a combination of Teriyaki Glaze & Wasabi Sauce. Served with Fresh Ginger. It’s Tasty, Spicy and Delicious! Seasoned with Lemon Pepper and Garlic then roasted to a crispy golden brown. Moist & Meaty!! USDA Prime Aged 24 oz. Bone In Rib Steak rubbed with a seasoned mixture of fresh Garlic, Ground Black Pepper & a touch of Olive Oil.  A Frank’s Signature Steak, You’ll Love It!! Over 36 oz. Large Cut! Monster Double Cut Prime Rib served with Horseradish Sauce. You won’t believe it!